Both the recent debate about the Maynooth seminary and the ongoing debate about religious education in schools seem to me to be sparks from the dying embers of pre-Vatican II clerical Christianity. It saw male clerical priesthood as set apart from the general run of humanity and in control of all aspects of God and the relationship between God and humans. I welcome these sparks as an occasion for dialogue. I hope that the present question of priest formation may lead to the issue of adult faith formation, which is, as I see it, the real need of the Irish Church today. I am now an elderly former Roman Catholic missionary sister. When I got toNigeria in 1959, I was shocked at the devastation of African cultural values that was involved in bringing the message of Jesus to a non-western culture. As a woman, I had no voice. But, because I was living outside Ireland, I experienced the full blast of the Second Vatican Council. I was thrilled by the new vistas for radical change in many faith- and church-related directions, brought about by the council. Now in Ireland, as I follow the church-related debates, what seems to me to be the real problem is that, at the end of Vatican II, Ireland avoided the major changes designed to bring Christianity into modernity because these involved loss of clerical power. New roles for laity and a new vision for religious education, in a new understanding of church, were not faced. The present lack of a strong loyal, critical, lay alternative to one-track male clerical thinking that had, until recently, a stranglehold on God and on all forms of public religious debate, is a problem. Since priesthood has traditionally held itself to be at the service of the laity and the pope to be the servant of the servants, I wonder if the Roman Catholic laity will even be asked if, and in what way, they still require the services of ordained priests? 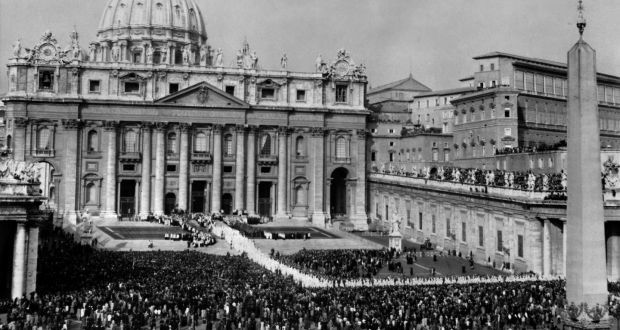 We are still in the 50th anniversary of the ending of Vatican II and of the publication of its documents. Clearly, these documents hold some glaring theological contradictions as the old and the new clash. Yet it is clear that their general movement is away from male priest-controlled, and towards adult-controlled, Christianity. Among the staggering changes that took place was the granting of religious liberty based on “the very dignity of the human person”. When we consider that for decades before, many popes had denied this right, based, I presume, on the assumption that they alone held infallible truth and the power to interpret God, we realise this was truly a breathtaking moment in the history of the church. Equally breathtaking was the new image of the church as “a sacrament – a sign of communion with God and of the unity of the whole human race”. This invited new parish structures and new ministries as local churches sought to become this “sign of communion with God”, a God beyond the grasp of human description. It also invited us to re-look at the seven sacraments. Recently, I was startled on a few occasions when I read statements about the Eucharist made by our forward-thinking priests of the Association of Catholic Priests. They bemoaned the dearth of vocations to the priesthood. Without priests, they said, the laity would be deprived of Eucharist. It seems their understanding of priesthood was confined to the male-ordained type. Part of my training in adult faith formation, in the aftermath of Vatican II, involved a questioning of priesthood as separate from laity, in favour of a shared priesthood of all Christians. Adult Christianity was underpinned by a new theology of earthly, as distinct from heavenly, realities. Much humbler in its approach to deity, the new theology claims no direct knowledge of God. All such knowledge is mediated through this world. Down through the decades, the concept of Eucharist has become ever richer in heavenly meanings but alas, often poorer in the simple earthly meaning of living by love. Might clerical ordained priesthood also be part of heavenly reality that needs to go? Irene Ní Mháille is a retired teacher, involved in adult faith development in parish and school, since Vatican II.